Instagram is a platform which is mostly associated with selfies, workout clips and photos of your dinner. It’s a shame, as it can be so much more. By its visual nature, it’s an ideal platform for sharing examples of and ideas about art. I use Instagram to find and follow artists from all around the work whose art I find interesting, and one of my early discoveries was Liverpool artist Cherie Grist. 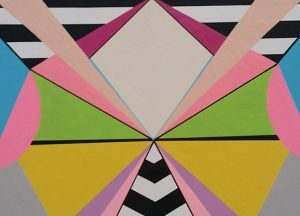 Based at 104 Duke Street Studios, the flashes of extremely bright colour and bold, geometric shapes which she teases on her account intrigued me. 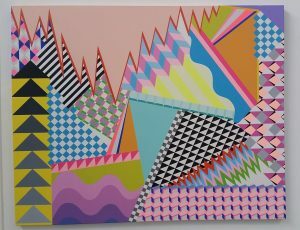 At this solo exhibition, I was interested to find out what the meaning behind the style was. In her introductory notes to “People”, Grist states that these paintings are about “people and their behaviour”. How would this be translated by the colours and forms I’d seen on the internet? Perfectly, it turns out. Grist’s artwork is deep, emotionally charged, and stylistically and emotionally right up my street. 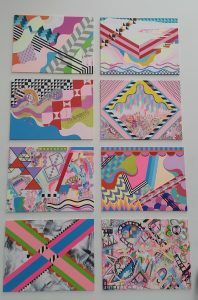 Her work reminds me of Kandinsky: colourful, bold shapes which have a strong emotional impact. 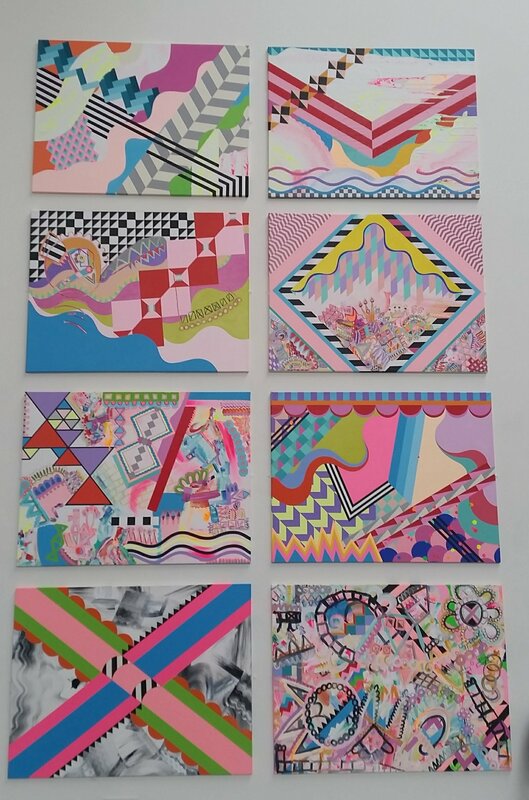 But she’s brought the idea right up-to-date, and her canvases feel more personal. Indeed, I found myself thinking of each canvas as an individual, putting their emotions on public display. How so? Well, the titles have a lot to do with it. You get a sense of what each piece is about just by looking at it, but the titles help the final pieces fall into place. 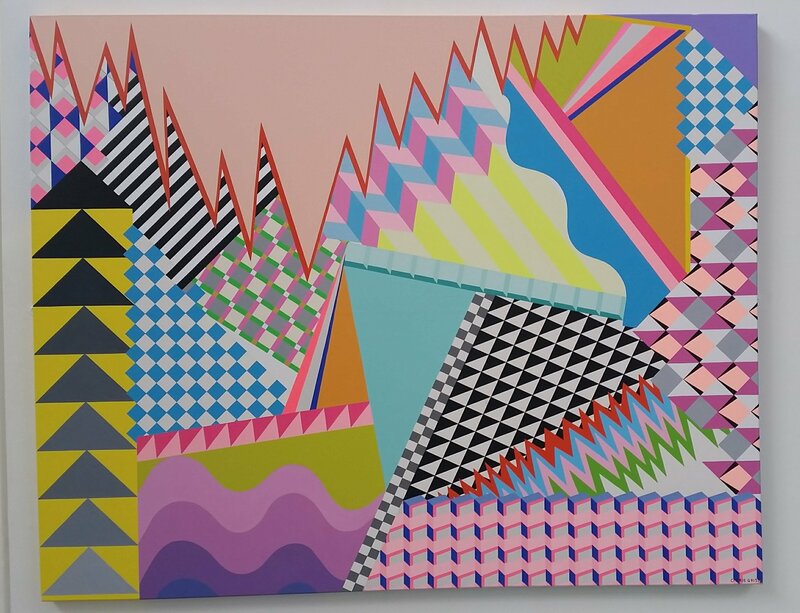 For example, the zig-zags and pointed imagery of one painting was making me feel particularly uncomfortable. Then I saw that it was called “Ranking“, and this made complete sense. Who hasn’t felt the sharp anxiety, the highs and lows, of being judged? “Ranking”, Cherie Grist. Much bigger (and better) in real life. And whilst they are all based on abstract forms and a similar colour palette, each painting very much has its own mood. “The Mind” is calm and ordered, “Reflection” as messy as I feel some days, “Own You” clearly focused on the material. And they each tackle their subject matter with admirable depth. Just as a person cannot be defined simplistically, each painting has so much for you to consider in its composition. When I left, I felt like I hadn’t even begun to scratch the surface of what each one was about. To give a context to her ideas, Grist has also assembled cases of – well, all sorts. Quotes, images from magazines, her own poetry. It gives you an idea not only of where her style comes from, but also very much her intention. Reading her words, I noticed that phrases to the effect of “just be me” appear again and again. These paintings are her ultimate self-expression – and our minds are complicated places. A myriad of experiences and emotions go into shaping our thoughts. In the same way, Grist puts these experiences and emotions onto the canvas. It’s up to us to let the diverse elements come together to create their emotional impression. Any fears I had about this exhibition revealing that there was nothing behind the surface were entirely dispelled. Their attractiveness is like a hook, pulling you in, encouraging you to discover the world within the canvas. Huyton Gallery is located within Huyton Library, and seems to keep slightly inconvenient opening hours. But if I can get time, I’m sure I’ll be going back. 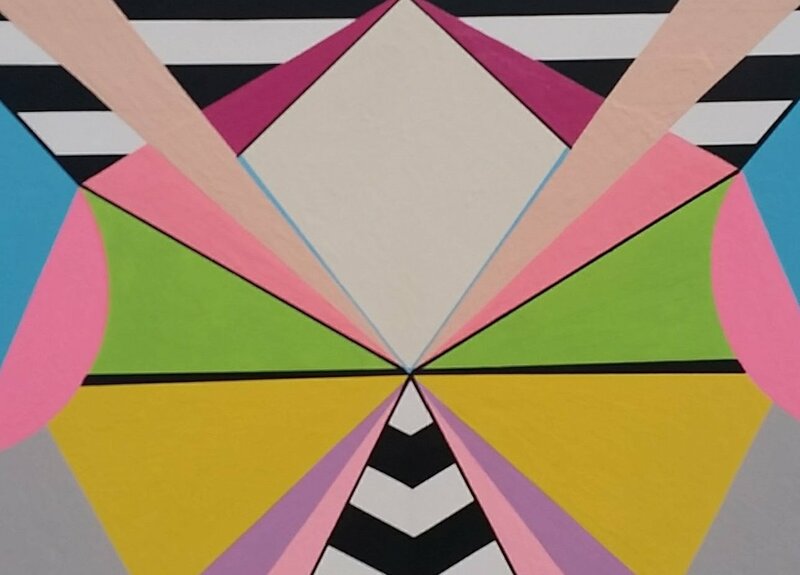 This entry was posted in Exhibitions, Home, Past exhibitions and tagged abstract, art, artist, colour, contemporary, emotion, Liverpool, local, painting, People. Bookmark the permalink.